This is full version of Caanoo's 1.5.0 firmware. Be sure to use a full charged battery! We take NO responsibility for broken Caanoos due to bad firmware flashes! Do so at your own risk! 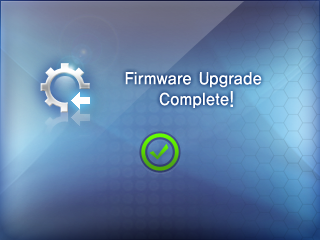 Who many time it take the firmware to update? Thanks to the developpers for having broken my Caanoo. @ kyosaeba: less than 1 minute if you update the firmware from v.1.0.6b and less than 2 minutes if you update the firmware from v.1.0.1 . @ Gab75: I let the firmware update for 1 hour and nothing happened. So I restarted my console but now it freezes at the "caanoo play forward" screen, and I can't do anything. With or without SD card, the console won't start. Does someone know what's new / fixed in this version? Thanks! Yep, same as toepoolest, I now have a shiny white paperweight, Looks like my Caanoo is toast. @toepoolest I re-flashed my Caanoo with firmware 1.0.6 and it's back up and running. Hope you can do the same. I can flash my caanoo with any firmware, it doesn't change anything : I only see the upgrade screen and nothing happens for hours. And when I try to start the console, it freezes on the GPH start logo. If anyone can help me? please. Did you try to update using a different SD Card? (I used a 2 Gbytes Sandisk SD Card and I upgraded my Caanoo without any problem). I also use a spare 2Gb Sandisk and out of curiosity I tried a second time and BINGO! For some reason I cannot explain it worked perfectly in under a minute. Difficult to see what the improvements are but I'll trust SimonGPH on this. What I'd like is a stable overclock to 900Mhz for MAME. Maybe that's in a later firmware update. Yes, the first time was with a 4Gb card so I'll always use this spare 2Gb from now on. I want to get toepoolest's Caanoo working. If you have a YouTube account toepoolest my channel name is nickbaldeagle01 Send me a personal message and we can arrange for you to post it to me to look at if you like. Well, give him a day or two to respond. It's now 1st November 2010. Let's see. Is there any risk to break the Caanoo when updating? Maybe you should update the console using a normal SD card and not an SDHC (I used a 2GB Sandisk and my Caanoo was updated with success). Muso, I think the problem lies in the choice of SD card. A bog standard 2Gb SD card seems to present no problem when upgrading. An SDHC card when used is causing the Caanoo to brick up. But it's definitely curable. I thought my Caanoo was bricked till I used an ordinary non SDHC card. It's now 14th Nov 2010 and toepoolest has yet to get in touch. In the meantime I've got Quake working and GNGEO with most of the games. Life is pretty good with my trusty little Caanoo. If you're reading this tooepoolest, get in touch. Your Caanoo can be rescued I'm sure. Thanks Baldeagle. I went for it, and I think you're right. I used a formatted 1GB SD card, and it worked perfectly to the letter of the instructions at the top of this page. I have had problems with different SD cards, but found the Kingston ones reliable. Sorry for the late answer. Well, I only updated my firmware to the 1.0.6, not to this one. What I did to make it work was to save all the content of my SD card and only put the firmware update on it. And it worked perfectly. When I will have time, i'll try the same thing with this one. Just do what I did, put the firmwave on an empty SD card and it will go well. Worked like a charm for my caanoo with a 16 Gb, class 6, A-data card the first time i tried, the card only had the upgrade files on it. It took less than a minute for me. Maybe some people had bad luck or maybe i was lucky. Only the korean gods knows the answer. YES! Nice one toepoolest. I've been checking this page every couple of days to see if you replied. The 1.0.6 will allow overclocking on MAME. It's now 27th November 2010. So, I found the time to update my Caanoo to this firmware. It all went perfectly. For what ever it is worth, I just got my Caanoo in the mail and upgraded all the way up and didnt have an issue. Sorry to hear about the trouble for the other members. I did the upgrade from a brand new Caanoo with firmware 1.0.1 to the 1.5.0 using the file above. I have a Sandisk SD HC 8gb and all went well. Hope this helps. Hi, i have some problem as toepoolest. I have SD cart 256 MB Kingston with label disk.Caanoo no upgrade. I am formated cart and no attribute label volume, go to upgrade. Upgrade is OK and perfect. I think what the problem is that during part of the process, it will ask you to reboot. When it does this, be sure to hold the right button in again when you turn it back on. I had the same issue with the frozen GP logo and then turned it on while holding in the R button for a second time and it worked like a charm. Just got my Caanoo today. Hoooohaaaaaw! 12/25/2010-For what its worth, 1.5.0 is coming installed on new orders shipped from Play Asia. My 1/2/2011 order from ThinkGeek came with 1.0.1. I successfully updated to 1.5.0.